« Roger Clemens : time for action, Bud. This entry was posted on December 25, 2007 at 8:45 pm	and is filed under BASEBALL, BASEBALL BOOKS, RED SOX, St. Louis Cardinals, Stan Musial, Ted Williams. You can follow any responses to this entry through the RSS 2.0 feed. You can leave a response, or trackback from your own site. One addendum: I met Ken Griffey, Sr recently. Knowing that and Musial hailed from Donora, Pa., I asked him if in his youth he had crossed paths with Musial. Turns out Musial was a strong influence. Griffey said his father left the Griffey home when he was a small child. He did not grow up knowing his Dad. But Musial had played ball on the same team as Griffey’s father. So when they did meet in Griffey’s early years, Stan was a link to his father. “Had it not been for Stan Musial, I would not have known anything about my father, what kind of man he was, what kind of ballplayer he was. Stan Musial did that for me.” Hearing this, one gets the sense that there is a lot beneath the surface. (KC. Oct. 15, 2008). 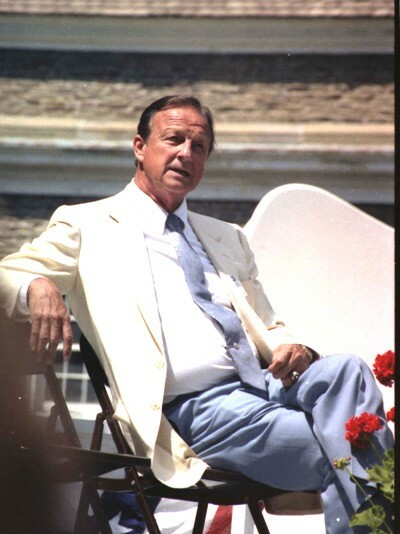 I remember the first time I saw Stan Musial was at Ebbet’s Field in Brooklyn. He was listed on the Brooklyn Eagle’s give-away score card as “Musial, OF.” Playing left field Musial’s arm was so sore and weak that whenever a ball was hit to him the Cardinal’s great short stop, Marty Marion, would run out to retrieve the ball from Musial to relay it back to the infield. Steve, that is one amazing memory. 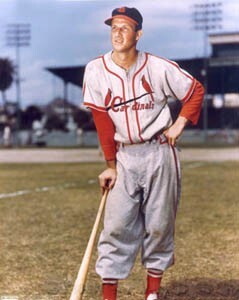 A weak arm from Musial, who started out as a pitcher. He must have been challenged with an arm injury when you saw him as a rook. The guy did have six seasons of 10 or more assists in the OF.